Or perhaps for the just plain hungry. Our subject is a vast one, so here you will find it divided into manageable portions. While in France, one should take their time with food - time to look at it, smell it, taste it and most of all, talk about it! Here is a start to understanding it all with recipes and wonderful stories along the way . . .
Appetizers include a wonderful variety of presentations: brochettes, canapés, toasts, feuilletés, verrines and much more. France has many wonderful mineral waters, each of which comes from a particular source. Find out to select the best bottled water for your needs. Along with cheese and wine, bread is an icon of the gourmet food experience. The incredibly popular baguette is the supporting actor in almost any meal in France. Start with baba au rhum and don't stop until you get to Saint Honoré - French cakes are almost as good to look at as they are to eat. Calissons, berlingots, and dragées are just a few of the sweet treats you will find kids and adults enjoying whenever they can. The blissful variety of popular cookies includes everything from sugary crisp speculoos to the classic butter biscuit known as a petit beurre. One of the most famous of viennoiseries, you can find buttery rich croissants in almost any bakery in France. These include some more unusual products such as crème fraîche and fromage blanc, but also a fantastic array of cheeses and lovely butter and cream. Even the yogurt is special in France. Learn what you might be served to drink in France, from the early morning coffee to the after dinner brandy. Mineral waters, wine, liqueurs and more. 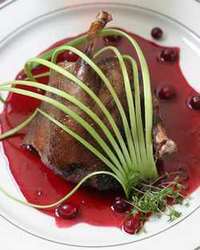 Have you had a great French dining experience lately - either in France or someplace else? Jump in here with your restaurant review or just enjoy those left by other readers! Classic salads, such as the salade Niçoise, are characterized by the freshness and variety of their ingredients. Sauces can be roughly divided into 4 different groups known as mother sauces. French sausage includes a vast array of dry and ready to cook sausages. Learn the difference between a saucisse and a saucisson and learn about some of the more popular varieties. French seasonings typically include lots of herbs, both fresh and dried, some spices and of course good old salt and pepper. There are several different categories of soups including potage, soupe, bouillon, and consommé. There are a few vegetables that are frequently used in cooking in France that you may not be familiar with. Learn about celery root, leeks, shallots, Belgian endive and other popular vegetables.